The beginning minutes of a Level 3 Marine Corps school: fine-tuning initial throttle and brake feel. Increased speed approaching a corner necessitates use of the brakes, at which point motorcycles begin to work as they were designed. Whew! I just flew home after a whirlwind week of instruction: two days of Yamaha Champions Riding School at Inde Motorsports Ranch in Willcox, Arizona; two more days of Level 3 training at Marine Corps Air Station Miramar near San Diego, California; and finally our first-ever Harley Owners Group clinics in Las Vegas, Nevada. These disparate groups are examples of why I want to plant something in every rider’s brain that is becoming more common in YCRS verbiage: I accelerate because I plan to brake. As regular readers know from reading this column, I believe trail-braking (reducing brake pressure as you add lean angle) is mandatory for everything from winning roadracing championships to riding to breakfast to enjoying a motorcycle vacation in the Alps. The bike is designed to trail-brake by the expert riders who developed it. People can (and do!) disagree on this subject but not after 10 minutes in a parking lot with me or any one of my instructors (or even school graduates) and a motorcycle; it’s provable, repeatable, important, and absolutely vital. I’ll put it clearly: Trail-brake or struggle. Everything works just fine when you’re riding slowly on a road you’ve memorized. The quicker you try to ride, however, the more critical trail-braking becomes. The less you know the road, the more critical trail-braking becomes. The faster the bike, the more critical trail-braking becomes. You get the point. So at YCRS we work on riders trailing their brakes into corners, but for that to happen they often must bring more speed toward the corner. They have decided to ride slowly everywhere because they were not going to use their brakes. Of course, that’s not a whole lot of fun. They know they must slow for the corner so they ride slowly everywhere. Asking riders to go faster can scare them, until we started adding the part about planning to brake. We practice this in straight-line drills then in trail-braking drills. Very soon, our “slow” riders are carrying significantly more speed toward the corner because they have a plan to not simply roll off the throttle and “hope” they make it, but to roll off the throttle, sneak on some brakes, and “guarantee” they make it. I’ve written about this a lot, so get educated in about 30 minutes by reading other columns or by watching YCRS videos. It’ll change your life, and it will help re-grow the street-riding aspect of the motorcycle industry. Slower riders don’t need to practice accelerating; they need to practice braking. In an earlier Ienatsch Tuesday column, I wrote about what to practice while braking. 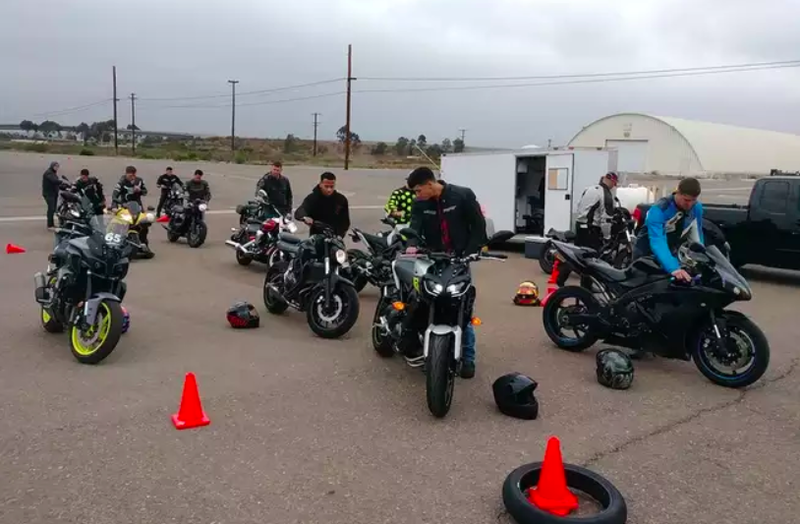 Braking practice is the secret to adding speed for any rider when they remember this: I accelerate because I plan to brake. How long do you trail-brake? Until you’re happy with your speed and direction. Research it: trail-braking.